If you have trouble of doing side or parallel parking and always need to go another few round just to get the right car park, now Ford Motor Co. has a great solution for you. 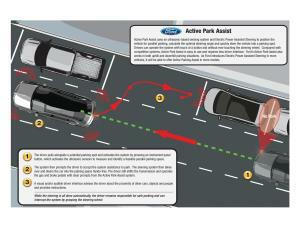 Named as Active Park Assist, it utilizes Ford famous electrical assisted steering technology that aims to assist vehicle drivers when comes to side parking convenience in space constraint location. The mechanism behind is it is relying on a number of ultrasonic sensors that will be able to sense the right position and adjust the steering angle automatically. What makes it more attractive is the operation can be simplified by only a single button push and more importantly, the system can intelligently does what is required without the need of any manual steering control by driver. According to Ford spokesperson, the new technology is even more reliable and effective as compared to other parking assist technology that is based on camera module, which still requires certain amount of manual control to make it work correctly. Besides, the new parking assist technology is claimed to be able to reduce CO2 emission as part of great effort in promoting green environment. Currently, Ford plans to integrate it into its luxurious Lincoln MKS and MKT model by mid of 2009 and will be implemented into other vehicle series by year 2012.